When I moved into Hope’s campus, I was already fairly certain I would be a History major. In grade school and high school, I had always enjoyed my history classes. AP United States, though, made something click. After clearing out of my head the misconception that a History major is good only for teaching, I enrolled in two history classes in my first semester at Hope. One of them was History 140 with Dr. Gibbs; the topic was early modern Europe. From that point, I was hooked on German history in particular. While working on my history major, I also worked on a German major. I went to a Lutheran k-8 school—they still teach German there! So, I had some experience coming in. But over my first three years at Hope, I spent a lot of time developing my research and writing skills, and had a lot of contact with German primary sources. Since my freshman year, I had also had a strong interest in law and government. Part of what made History attractive to me was that it’s traditionally seen as a good pre-law school major. Now, law and German history—how does somebody combine those? You might imagine my excitement when I found out that my hometown of Frankenmuth, Michigan could help set me up with an internship at a law firm in our sister city of Gunzenhausen, Germany. Coincidentally, a very distant and previously-unknown relative of mine had founded the firm. So, this past summer, I spent about a month working as an intern at the Meyerhuber Rechtsanwälte (lawyers) firm. I had the incredible opportunity to see many aspects of the German legal system—the frequency of small lawsuits, the ways in which the court structure differed from the American system (no juries, and no case law). I also saw that my History major had definitely taught me some very important skills. Being able to find information that could build your case was crucial. The complexity we deal with in history is also good practice. None of the cases I saw were cut-and-dry. Almost all of them involved a question about the law, and building a successful argument required careful thinking on the part of the attorneys. While I was in Germany, I also took some time away from the law firm to interview a group of people running a volunteer refugee organization. What I found was that this went far beyond providing food and shelter. These volunteers were working hard to help refugees in Germany, many of them from Syria, with the problems that they face entering a new country very different from their own. Language and integration courses, education, and finding work for refugees are some of the group’s primary objectives. The ultimate goal for the refugees is self-reliance. My experiences in Germany over the summer guided the development of my current Honors History project on the history of German refugee policy and how that history applies to the present day. This project is still in the writing phase; however, it will be a website by the end of the semester. 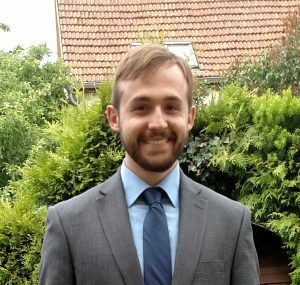 At the moment, I am applying to law schools, and I have a new focus and understanding because of my internship in Germany. I’m also glad that I have the opportunity to process that experience in my coursework here at Hope. Next Next post: It’s Fulbright Season!